The demographics suggest a different religion flourishing there, and I want to wish our Taoist brothers & sisters all the best. That is a very dry piece of humour. What about the US? Do you really see dear old uncle Billy Bob yelling mazel tov one day? Your Taoist-phobia chills my blood. It's a beautiful, rich tradition, and Europe won't survive without this precious diversity. I love the yin-yang symbol. It makes me think of Grateful Dead concerts. There are Noachide "congregations" in the US. TeNaK Talk is out of Texas. How fast could it spread? Rodney Stark maintains that it's not theology that propels a religious system; it's sociological factors. This is counterintuitive to those of us who frequent philosophy forums. We're in the Turing machine wing of the building and we project our approach to others: it's all about philosophy & theology. Who would change his affiliation for any other reason? Most folks, it seems. The South is the one place that treats the Bible seriously, as the literal Word of G-d. They'd actually be more likely than any other place to go Noachide. Alas, I suspect that says more about how unlikely the world is to go Noahide than how likely the South is to. This is counterintuitive to those of us who frequent philosophy forums. We're in the Turing machine wing of the building and we project our approach to others: it's all about philosophy & theology. Who would change his affiliation for any other reason? Most folks, it seems. I used to think: How could anyone who actually goes outside think that people are fundamentally rational and can be convinced by complex philosophical arguments? Now, I'm not so sure. I've gradually shifted my position over the last year. It's more complicated than this, even. Some very intelligent people don't/can't apply their smarts to these issues. I have Mensa-tier friends whose eyes glaze over at talk of modal collapse, Leibniz vs. Kalaam, the efficacy of the Neo-Platonic argument, how to steel-man the Kuzari, etc. They can't believe anyone worries about such things. It almost feels like a form of gas-lighting! That's a MAJOR switch! To what do you attribute this? 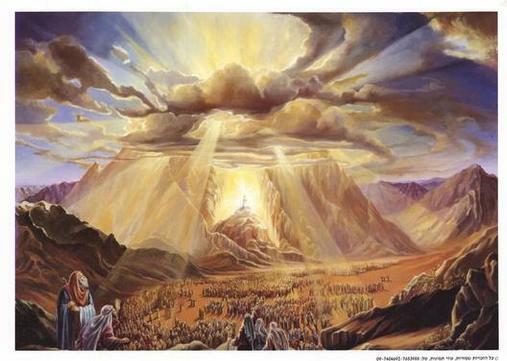 Relevant to the thread: Jacob's Ladder in this week's Torah portion (Vayeitzei) is face-melting. Not to be confused with the Rush song. "You can take 'western civilization.' I'll take A-mighty G-d."